A well printed and presented product from Bombshell Decal. 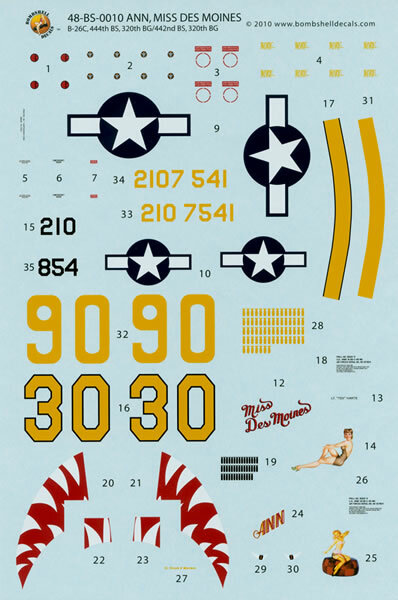 48-BS-0010 is the second of the two new sheets recently released from the North Carolina based Bombshell Decals. B-26C-45-MO 42-107541 “ANN” assigned to the 444th Bomb Squadron and piloted by a 2nd Lieutenant Leland C. Sherman. 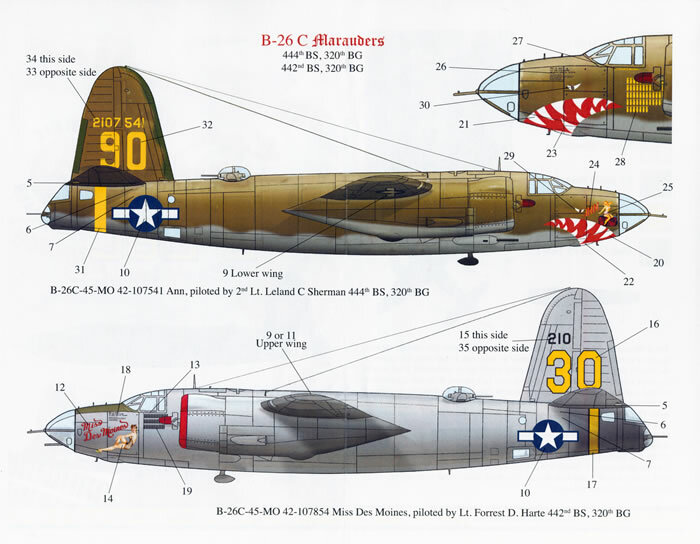 The machine is in the olive drab over neutral grey camouflage scheme and sports an impressive shark mouth marking as well as large numeral ‘90’ on the vertical stabiliser/rudder and a yellow band around the rear fuselage underneath the horizontal stabilisers. The scantily clad Ann herself is also featured on the left hand side of the nose with an impressive mission log on the left hand side of the nose. B-26C-45-MO 42-107854 “Miss Des Moines” belonging to the 442nd Bomb Squadron and piloted by a Lieutenant Forrest D. Harte. This option is in overall natural metal finish and also wears the 320th yellow marking around the tail as well as large numeral 30 on the vertical stabiliser/rudder and red cowling lips/spinners. 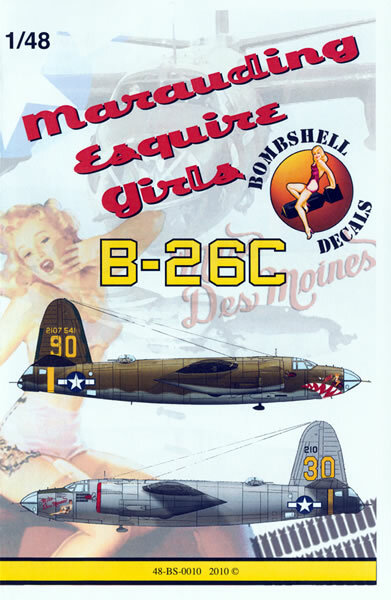 Nose art is in the form of the name “Miss Des Moines” in red and impressive swim suit wearing nose art beside a mission log. The decals themselves have been printed by Cartograf. They are thin and in perfect register. The art work on the nose art is beautifully done indeed! A single set of national insignia is provided along with a set single set of stencil data including individual and correct data blocks. 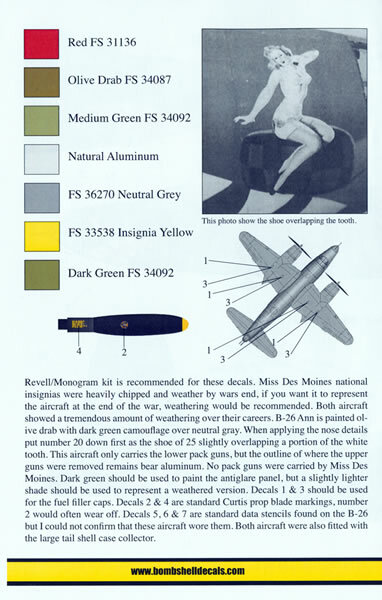 The placement guide is in the form of an A-4 sized sheet that carries full colour drawings of both options – a right hand side profile for “ANN” and a left hand side profile of “Miss Des Moines”. You also get a left hand side scrap view of “ANN” to show placement of the mission markings and the shark mouth marking. A single generic upper surface plan view is provides as well as a drawing of a propeller blade to show placement of the stencil data. The placement guide also caries notes advising you of the peculiarities pertinent to each option’s markings as well as its equipment fit-out and notes on how to apply the shark mouth marking to the “ANN” option. The Monogram/Revell kit is recommended for these decals.